I saw a sad little exchange today. A brown dog and a black dog met, and, while their humans chatted, the brown dog play bowed and invited the black dog to engage. The black dog’s human reacted by jerking his dog backward, away from the brown dog in what seemed a defensive or fearful response. Brown dog’s human pulled his dog away too, then leaned down and gave brown dog a stern talking-to. It seemed that both humans completely misunderstood the play bow and the friendliness in brown dog’s approach and demeanor. This happened just a few minutes after a conversation with a friend who had described her communication with her birds. She doesn’t teach them English; she doesn’t exactly speak their language, but they have all evolved a communication that goes beyond words and human language to describe a relationship and mutual respect and understanding. I know little of birds; I do strive for that sort of communication with the dogs in my life, though. The dogs learn many words of English (Hebrew, too, in Jana’s case). They also excel at reading human body language. But there is another layer that comes from a deep, close relationship. It is communication. It might be language, but it’s not something anyone outside the group would understand. When a person gets to that level of communication with her dog (or her bird), it is very satisfying and intimate. Jana and I had that kind of connection, and it’s what makes her loss so hard. Most dogs seem to try very hard to understand their people; many succeed at understanding lots of people and dogs, even cats, if they live with a cat or two. 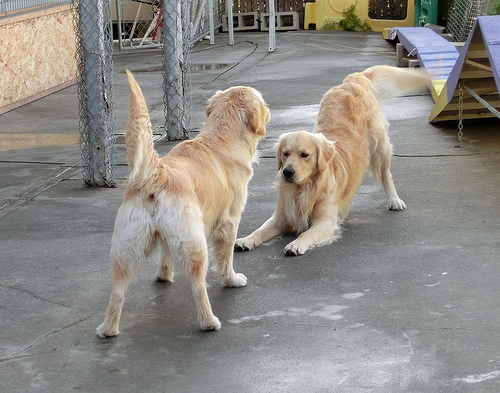 It would be nice if more people made the effort to learn the basics of dog-to-dog and dog-to-human communication. Aweeee, but it’s so cute when they play bow. How could anyone think that’s bad?